What happened to the Buran space shuttle? Why was the Soviet shuttle's triumphant launch its first and last? And is there any hope that a Russian shuttle might at some point head for the stars? The Buran’s flight, which lasted 205 minutes, was a total sensation. 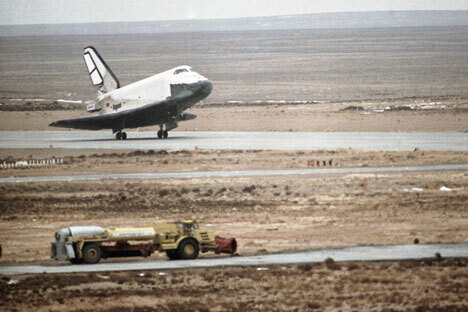 The Soviet space shuttle was the first such craft anywhere in the world to land automatically, whereas American shuttles never learned to do this; they only ever did so manually. But why was the Buran’s triumphant launch its one and only launch? And is there any hope that a Russian shuttle might at some point head for the stars? Rossiyskaya Gazeta spoke to Valeriy Burdakov, one of the men behind the Buran project, where he worked as a head of department at the Energiya scientific production association. He is now a professor at the Moscow Aviation Institute. Rossiyskaya Gazeta: Valeriy Pavlovich, people say that the Buran spacecraft was the most complex machine ever created by mankind. Valeriy Burdakov: Definitely. Until the Buran came along, the American space shuttle was at the top of the tree. But the Buran was capable of much more than the American shuttle, both in terms of the payload it could bring back to Earth (20 to 30 tons rather than 14.5 tons) and the range of its center of gravity. We could have withdrawn the Mir space station from orbit and turned it into a museum exhibit! Unmanned landings, no toxic fuel, horizontal flight tests, and transporting the rocket’s tanks on a specially designed aircraft. Everything was superb. R.G. : Who was the first person to come up with the idea of an aircraft-style orbital vehicle that could land on a runway just like an aircraft? V.B. : [Sergey] Korolev! That’s what I heard from Sergey Pavlovich himself. In 1929 he was 23, and he was already a well-known glider pilot. He was toying with the idea of taking a glider up to 6 km, and then into the stratosphere, using a hermetically sealed cockpit. He decided to go and visit [Konstantin] Tsiolkovskiy to get him to sign a letter confirming that a flight at this height was viable. R.G. : Did Tsiolkovskiy sign it? V.B. : No. He criticized the idea. He said that, without a liquid-fuel rocket engine, the glider could not be controlled at that sort of height, and would break up as it fell and gained speed. Tsiolkovskiy gave Korolev a little book called “Space missile trains,” and advised him to have a think about using liquid-fuel rocket engines for flights not into the stratosphere, but even higher, into the ether. Korolev was very annoyed. R.G. : And when did you start working on the Buran project? V.B. : Back in 1962, with Sergey Pavlovich’s support, I obtained my first inventor’s certificate for a reusable space vehicle. When the fuss started up over the American shuttle, no decision had yet been taken about whether we should go the same way. But Energiya’s so-called Service No. 16 was set up in 1974. It had two design departments – mine looking at aircraft, and Yefrem Dubinskiy’s taking care of launch vehicles. We dealt with translations, scientific analysis, editing and publication of “primers” on the shuttle. And without any fuss, we developed our own version of the spacecraft and its launch vehicle. R.G. : The precision with which the Buran landed utterly stunned everyone. V.B. : When the spacecraft emerged from the clouds, one of the managers was virtually delirious, and kept saying: “It’s gonna crash! it’s gonna crash!” Everyone gasped when the Buran began to turn so that it was at right angles to the runway. But in actual fact, this maneuver was all part of the plan. It seems, however, that the manager in question either didn’t know this or had forgotten. The spacecraft landed right on the runway. Those 205 minutes when the Buran was in flight passed off without a single criticism being leveled at its designers. R.G. : How did you feel after this triumph? V.B. : Words can’t really express it. But there was another sensation on the way: They closed down what was a successful and innovative project. In the end, 15 billion rubles was wasted. R.G. : Will the scientific and technical know-how from the Buran project ever be used? V.B. : Like the shuttle, the Buran was not financially viable because the launch system was expensive and clumsy. But those unique technical solutions can be developed further as part of the Buran-M project. A new spacecraft that has been modified to take account of the latest developments could become a very quick, reliable and convenient way of transporting passengers and tourists between continents. But for this to happen, we have to create a multi-use, one-stage, all-azimuth environmentally friendly launch vehicle (MOVEN), to replace the Soyuz rocket. Incidentally, the new vehicle will not require such a cumbersome launch, so it can also take off from the Vostochnyy cosmodrome. The Buran know-how has not vanished. The automatic landing of an aircraft inspired fifth-generation fighter jets and numerous unmanned aerial vehicles. It’s just that, as was the case with artificial satellites, we got there first. R.G. : In your opinion, what’s the outlook for the space industry at present? V.B. : The hydrocarbon era is about to be replaced by an era of atomic and solar energy that is inconceivable unless we use a very wide range of spacecraft. In order to set up space-based solar power stations to supply energy to consumers on Earth, we will require vehicles that can carry a payload of 250 tons. They will be based on the MOVEN. And if you’re asking me about the space industry as a whole, then it is set to meet all of mankind’s needs, and not just the information needs that it meets at the moment.